As an accomplished Design, Technology and Innovation Consultant at Activrightbrain, Writer, Presenter, Host, Futurologist and BBC tech pundit, Dean Johnson is shaping the connected future for Film, TV, Automotive, Publishing, Music, Education and Leisure sectors with the emphasis on user experience and engagement. Dean is a Fellow and Vice President of the Chartered Society of Designers and a Mentor for the British Fashion Council and Startup Sesame. Continuing to push boundaries in design and technology, Dean spent 48 hours in Virtual Reality in 2017 and is now building a full body XR Immersion Suit featuring haptics, AR, VR, Bionic enhancements and a flame thrower. He’s already living in the future. Dean writes for numerous publications, his own blog ( www.activrightbrain.com ) and is the author of international #1 interactive iBook ‘Digital Publishing: The Next Steps’. I wasn’t a usual kid and started my first business at the age of 13 – publishing a home computer magazine and software label. This motivated me to take graphic design seriously as a profession, but the intense fascination with technology remained. Through roles at various creative agencies (including my own) my network of startups and brand relationships brought technology to the forefront once more. I have moved from ‘hands-on’ design work, to creative thinking to designing the future! But I’m not keen on the term ‘expert’. Too many people claim to be experts, gurus or ninjas when all the experience they have is in researching a particular field, rather than rolling up their sleeves and getting stuck in. I believe in pushing boundaries to achieve results and that’s something I’ve demonstrated consistently throughout my career. That’s how I’ve become someone willing and able to make a difference. WHAT AREAS OF INNOVATION ARE YOU MOST PASSIONATE ABOUT? If we’re talking about a passion for technology, then my background in VR, AR and AI is driven by their potential to fundamentally change lives and create magical experiences. Ironically, I’m equally passionate about my bad experiences as I’ve spent years advising clients which technologies to avoid and what not to do. They need to genuinely add value or they’re too easily discarded by consumers with little or no ROI. I am – and always will be – a ‘petrol-head’ at heart (even if that now includes electrification for the future!) I love cars and have been fortunate to work with automotive brands for a couple of decades. In that time my role in that relationship has changed from visual communications outside the car to visualising how we’ll interact with the interiors of new Mobility solutions. It’s the area I’m most excited about, because it encompasses so much magical technology – from VR and AR to AI and IoT. WHICH INNOVATION INFLUENCERS INFLUENCE YOU? Most ‘Influencers’ just don’t influence me – Brands and leaders do. Elon Musk may be obvious, but he’s up there thanks to his unwillingness to accept boundaries. He not only has his own cutting-edge car brand and space rockets, but he continues to raise other mobility expectations and deliver on the promise of a flamethrower for the masses (although I’m not convinced this one’s a great idea). Richard Browning – otherwise known and the ‘Rocket Man’. Richard has designed and built his own jet engines, strapped them to his back and arms and is smashing boundaries for personal mobility, because we all want to be Iron Man. 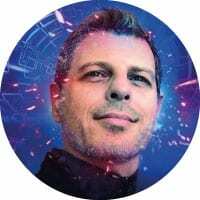 Tom Emrich is someone I’ve followed and known for a few years and parts of our careers have genuine parallels in Wearable Tech, VR and AR insight. He has his finger in the pulse, investing in tech through Super Ventures and runs the hugely successful AWE conferences and events. OUTSIDE OF INNOVATION WHO ELSE INFLUENCES YOU? Jac Holzman inspires and influences me – in real life. He’s a global music legend and founder of Elektra Records amongst many other things but his lifelong fascination with technology and an unwillingness to accept limitations has resulted in a continual quest for innovation. I was fortunate to work with him on Number 1 iPad app ‘The Doors’ (a band he discovered and signed in the 1960s) and I am honoured to consider him a friend. Victoria Taylor is an inspiration in my life and everyone she influences – naturally, rather than aspiring to be an influencer. From marketing smarts, to experiential magic, to life skills she somehow manages to make social channels outlets for conversation rather than one-sided broadcast. And that’s a lesson for us all. Comedy is a personal and positive way to engage an audience. I follow a number of comedians on various channels but Dave Gibson and Nick Harvey stand out from the stand ups, because they’re real people – Dave’s a Senior Social Content Producer at the BBC and Nick is a talented TV score musician. They understand life, what makes us tick and what makes us laugh. I speak at a number of conferences so get to hear some of the most inspirational and knowledgeable individuals (and a few also-rans) and this is a brilliant way to absorb information. I also read a lot of fiction – to switch my brain off from the detail and think creatively about the bigger picture. Fiction, like film, offers escapism and motivation in equal measures. Artificial Intelligence is driving a lot at the moment, however currently it’s driving conversation rather than practical application, But that is set to change when we move from simulated intelligence (Siri, Alexa, etc) and bots simply responding to algorithms, to something far more substantial – genuinely artificial intelligence. Autonomous vehicles and conversational learning are just at the tip of the iceberg.The next stage is to make it work based on a reason why. Like all technology, we need to add value having determined what that is. Mobility is a key area of focus for me as I’ve worked with the automotive industry for more than two decades and it now encompasses the design and passion that originally attracted me to it – plus the extraordinary technology set to revolutionise the way we regard transport, cities and personal freedom. Its a stunning combination of AI, AR, VR, IoT and product design. I work with brands and agencies to advise on the practical application of new and emerging technology. This includes providing inspirational thought-leadership or educating and empowering teams to design the future themselves. I speak about and demonstrate the advantages (and pitfalls) of new technology and how we engage new and existing audiences via most broadcast channels, public stages and the written word. First take a few minutes to check out my website, view the showreel on the site or here on YouTube then kick off a conversation through my contact page or on Twitter or or Instagram.